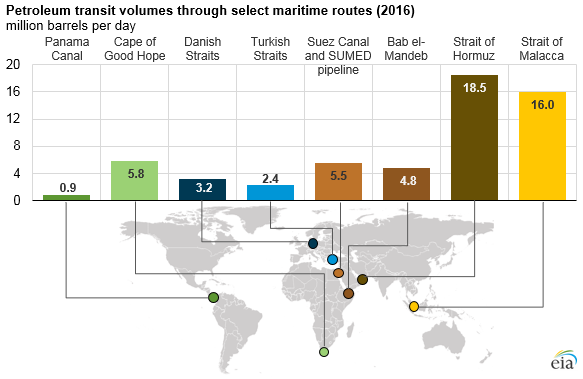 By volume of oil transit, the Strait of Hormuz (leading out of the Persian Gulf) and the Strait of Malacca (linking the Indian and Pacific Oceans) are the world's most important strategic chokepoints. The Cape of Good Hope, near the southern tip of Africa, is a major oil trade route and potential alternate route to certain chokepoints. The AFRA system classifies tanker vessels according to deadweight tons—a measure of a ship's capacity to carry cargo. The approximate capacity of a ship in barrels is determined using an estimated 90% of a ship's deadweight tonnage, which is multiplied by a barrel-per-metric-ton conversion factor specific to each type of petroleum product and crude oil, because liquid fuel densities vary by type and grade. Note: AFRAMAX is not an official vessel classification on the AFRA scale but is shown here for comparison.